Description: Elenco's Snap Circuits® makes learning electronics easy and fun! Just follow the colorful pictures in the manual and build exciting projects such as FM radios, digital voice recorders, AM radios, burglar alarms, doorbells, and much more! You can even play electronic games with your friends. All parts are mounted on plastic modules and snap together with ease. Enjoy hours of educational fun while learning about electronics. No tools required. Extreme Version - Contains over 80 parts to build over 750 projects. Includes everything from SC-500 plus projects in solar, electromagnetism, vibration switches, and 70 computer interfaced projects. Includes Projects 512-692 and CI-73 manuals. Contains over 80 snap-together parts. Build over 750 projects. Electrical components provide users ages 8+ with hands-on experience designing and building models of working electrical circuits. Requires 4 "AA" batteries (included) or electrical outlet adapter (included as well). Clear and concise illustrated manuals included and available online. The software in this product is not Mac-compatible, but you can find a similar Mac version here. It will not match the manual exactly, but the differences are minor and it should be easy to understand. Also included in our Snap Circuits Tech to Lend kit is the Snap Circuits Lights Electronic Discovery Kit! This innovative kit contains over 55 color-coded, real circuit components that snap together to create working electronic circuits and devices. This set offers an additional 175 plus do-it-yourself projects that will provides entertaining, concrete education on how electronics work. The pieces include snap wires, a color changing LED, glow-in-the-dark propeller, infrared receiver, strobe IC and much, much more. They all snap together easily on the included plastic grid -- no soldering required. Each piece is numbered and color-coded to make identifying them easy. These components combine to create working circuit boards just like the ones found inside televisions, radios, and other electronic devices. Because the projects are arranged in order of complexity, users can build on their skills as they progress through the manuals. The lessons start out with a simple LED light and switch project that demonstrates how electricity is turned on and off with a switch. Other projects include: Infrared Detector, strobe light with spinning patterns, color changing LED, glow-in-the-dark flying fan, strobe integrated circuit (IC), fiber optic communication, color organ controlled by iPod or other MP3 Player and many more. Once users have mastered several of techniques introduced in these kits, they can use the components to experiment and create their own customized circuits and electronic devices. 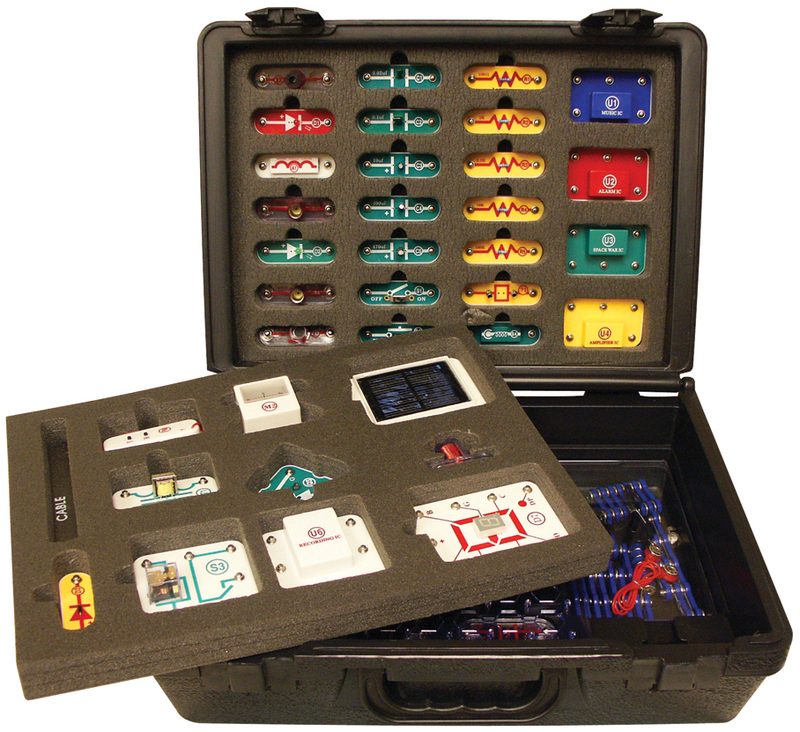 All Snap Circuits kits are compatible to take the kit - - and your fun - - to the next level!